Meet the Buckie S6 pupils whose business acumen and artistic skills made over £3000 for Moray based children’s cancer charity Logan’s Fund. The Young Enterprise group named their business Nevada and sold unique handmade Christmas ‘snowmannies’ made from basic supplies of socks, buttons, rice and ribbons. The group consisted of pupils Erin McKenzie, Megan McGowan, Isla McRae, Emmy-Jo Munro, Niamh Paterson and Taylor Patient who also performed the role of group leader / managing director and they were mentored by teacher Sarah Matthews. The girls made their snowmannies in 3 different sizes, each one unique and were gender specific and even came pre-named. The girls sold their dolls at local events such as a Buckie Christmas Kracker, Findochty Christmas Lights as well as Buckie High School Christmas Fayre and Rothes Christmas Market as well as developing up a roaring trade on social media. The demand exceeded the girl’s expectations and gave them great insight to the pressures of fulfilling orders in the retail world. The girls chose Logan’s Fund as the charity they would use their business idea to raise money for. Group Leader Taylor Patient explains “We as a group felt Logan’s Fund was the perfect organisation to donate our profits to as we were moved by the kindness of this charity and how the money we raised would be used to help a suffering family find an alternative focus away from hospitals and treatment that their child is going through. This is something we all wished to be part of. A significant part of our spare time was spent making the snowmen, each made to order for customers, we were completely astounded and delighted by our finishing profit of £3446.00 that we could proudly donate to this worthy charity”. Erin McKenzie added “We all want to thank Logan’s Fund for their cooperation and help throughout the process of selling our snowmen including inviting us to a fundraising craft night and finding the time to meet us and discuss what initiatives like our can mean for their charity’s work”. Pictured receiving the cheque on behalf of Logan’s Fund is 7 year old Ehryn Andrews from Elgin and her mum Lyanne. Ehryn was diagnosed with an osteosarcoma tumour in her pelvis on her 6th birthday in October 2014. Over the following months Ehryn endured several intensive periods of chemotherapy as well as other treatments and a ten hour operation to remove her tumour. The chemotherapy took a huge toll on Ehryn’s young body resulting in heart failure in July last year. A successful heart transplant took place a short while later the later part of 2015 saw Ehryn go into remission from the cancer. Early in her treatment Logan’s Fund promised Ehryn and her family a special holiday once she was able and cleared to travel abroad. In July Ehryn jets off into some Majorca sunshine. Something Logan’s Fund were very keen to start doing this year was arranging for people who have gone to amazing time and efforts to raise money for us to meet the children that we are helping. In most instances the closest someone gets to the charity they have raised money for is meeting someone from the charity and reading about the charity’s work online or in the press. 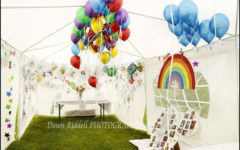 We want to be different, we thought it would be inspiring for people who have supported us to meet the kids whose life they are making a direct impact on, it kind of completes the fundraising journey in the perfect way. We thought the ‘Nevada’ girls were the perfect group to launch this idea with. I think everyone was thrilled that afternoon when Ehryn met the girls, the girls were definitely thrilled, we were thrilled, their teacher Sarah was thrilled and Ehryn was thrilled too. Niamh from the group added “Meeting Ehryn and knowing she would benefit from the money we raised in our enterprise project was really great. 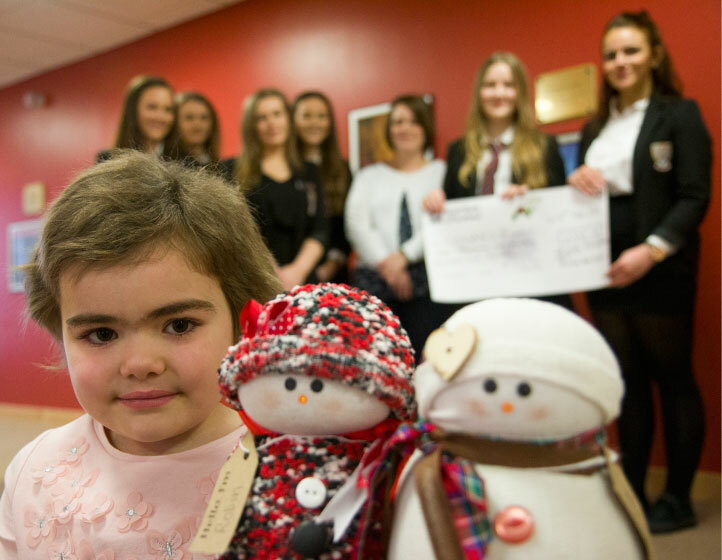 She is a lovely brave wee girl and is very deserving of the opportunities Logan’s Fund grant”. At the Buckie High School Enterprise Presentation final the girls won 3 out of the 4 awards up for grabs; Best Business Report, Best Display and the prestigious Overall Winners Award. What an amazing achievement. Young Enterprise is an extracurricular activity offered by schools to their S6 pupils requiring them within a group to develop, produce and market a product to the public with the aim of making a profit. By taking part in Young Enterprise pupils can benefit from the experience of real life business, from the production line to marketing and selling and overcoming the difficult problems that this can throw up daily.